In this shallow information world, a headline is about all it takes to quench one’s interest in maniacs attacking bus stops. If it was another 8,000 rockets landing on Jews in Israel, that would be somewhat quixotic to NYT’s latte-slurpers, but transit molestation is always dull, even when announced by an old gray mare. 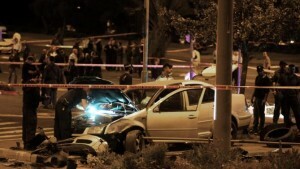 JERUSALEM — A preliminary investigation of a Palestinian driver who crashed into a bus stop in Jerusalem late Wednesday night, killing an Israeli man and injuring an Israeli woman, reinforced suspicions that he had rammed his car into the pedestrians intentionally, the Israeli police said Thursday. Khaled Koutineh, 37, from Anata, was arrested for running over and killing Shalom Yohai Cherki, 25, and seriously injuring a young woman. The east Jerusalem Palestinian who rammed his car into Israelis waiting at a bus stop in the French Hill section of the capital last week told police that he was intent on “seeking out Jews to murder,” authorities permitted the press to report on Tuesday. On tv and the web, there was little coverage, even though the AP Jerusalem Bureau has more correspondents than several European countries combined. An Israeli who is killed by a terrorist is not big news in this era, just something to be reported like a car hitting a bus stop.